It is with sadness and heavy hearts that we share the news that Jack “Nolan” Warne died peacefully on Wednesday, December 5th, 2018, 7:00pm at Vancouver’s BC Children’s Hospital. He was surrounded by the love of friends and family. Nolan was born January 15th 2008, a true miracle, who despite his limitations, survived and thrived for ten full years. His mom, Anna Warne, enjoyed every moment of her time with her little boy, until she succumbed to her own illness when he was four years old. 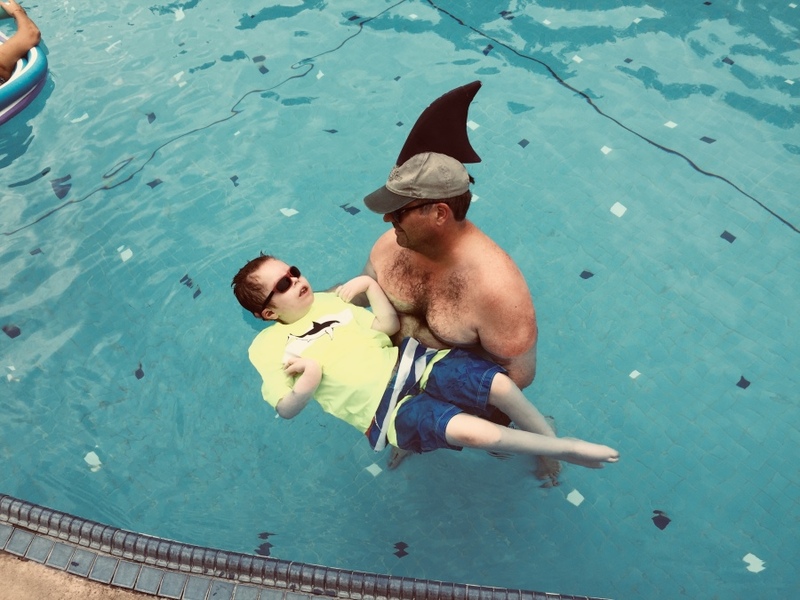 John “Gardie” Warne, Nolan’s dad, continued to provide the best life he could for their son, taking him on many adventures, caring for his every need, and loving him in every moment. Nolan took pleasures in the simple things in life; music, dancing in our arms, soaking in baths and warm hot springs, finger painting, videos and stories on his iPad, being doted on by his little friends at school, dressing up in fun costumes, and embarking on many adventures. He was a thrill seeker, loved rustling, wrestling, tickling, going fast in his buggy, tobogganing with his dad, and big swings at the playground. Nolan’s life was a joy, but he came into the world amongst many uncertainties and fears. Gardie and Anna had always planned on growing a family together; Nolan was much wanted and planned. But life can be unpredictable. In the spring of 2007, Anna received both a diagnoses of advanced stage breast cancer and a positive pregnancy test in the same week. With the encouragement of doctors and specialists, Anna began treatment, including a mastectomy and six rounds of chemotherapy, right away. It was a scary and uncertain time. On January 15th, 2008, Nolan was born at 35 weeks, a tiny little guy weighing 3 pounds, 13 ounces. His prognosis was uncertain, and he experienced many complications including stop-breathing episodes, which required resuscitation. Anna and Gardie spent every waking hour with Nolan, tirelessly sitting bedside, reading, singing, feeding and rocking their baby boy. They were told numerous times that he would not survive, that he would never feed independently, that he may never come home. But they never lost hope. After six months in the NICU, Nolan came home. Gardie and Anna committed to enjoying life and creating as many memories as possible. They made him beautiful organic meals, embarked on many alternative therapies, always considering his needs and comfort. They had many adventures including trips across BC, Washington, California and Hawaii. Everyone around them could see the immensity of their love, joy and gratitude of being a family. They had great humour and made the most of each moment. Despite her strong and courageous spirit, Anna’s cancer took hold and she died on April 14th, 2012. Gardie continued to care for their son with the same commitment and endurance, only now without the companionship and support of his beloved wife, Nolan’s mother. Nolan was diagnosed with several conditions including Cerebral Palsy, low muscle tone, epilepsy, and global developmental delay. Over his lifetime, he had numerous surgeries, countless medical and specialist appointments, and interventions. His scoliosis worsened over time, leaving him vulnerable to infections, viruses and pneumonia. Over the next six years, Gardie was unable to work and committed his life to Nolan’s care. Throughout his life, Nolan brought hope and joy to his family and community. He offered the world lessons in love, compassion, commitment and courage. He was a messenger, a gift and a mirror to our own vulnerabilities, our hopes and fears, and our ability to love unconditionally. When it was time, Nolan left the world gently, peacefully and with great love. Thank you, Beautiful Boy. Now you return to the loving arms of your momma, who has been waiting for you. Godspeed.